Some films this year have obvious heroes, and obvious villains – but what do you call someone who has been shamed into hiding a fifty year old secret? In Stephen Frears’ Philomena, our protagonist is forced to come to terms with her painful past, and yet, holds onto her belief in the greater good. 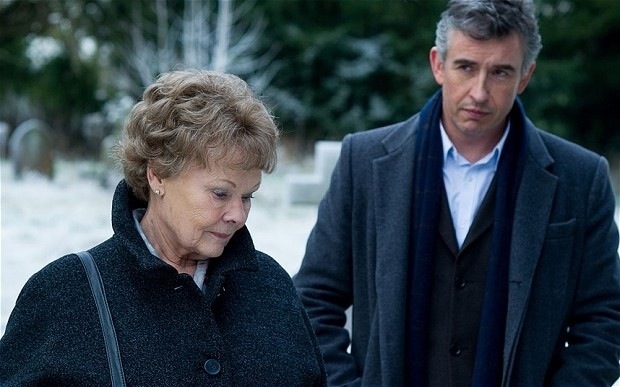 Philomena, based on a true story (with the film written by Jeff Pope and Steve Coogan, one of the two stars), throws the misdeeds of the Catholic Church into harsh light through one woman’s tragedy. Philomena Lee, as a pregnant teenager living in an abbey, has her young son taken from her, never to be seen again. Played in her old age by Judi Dench, she enlists the help of former journalist Martin Sixsmith (Coogan) to find her son and finally see him again after fifty long years. The abbey is less than helpful, but the two do discover that Philomena’s son, Anthony, was adopted by an American family, so they head to D.C. to dig a little more. There, the story becomes truly tragic. Anthony, renamed Michael by his adoptive parents, who had served as a lawyer and senior official in both the Reagan and Bush Sr. administrations, had died nine years earlier. As it turns out, Michael was gay, though only his closest friends knew, and died of AIDS. Upon meeting his former partner, they discover that he did, in the last few years of his life, go looking for Philomena, even traveling to the abbey and choosing to be buried in its graveyard. The nuns and authorities at the abbey purposefully kept Philomena and her son apart, which infuriates Martin, but Philomena still finds it in herself to forgive. They decide together to publish the story, bringing to light the stories of hundreds of Irish babies that were sold to American parents through the Catholic Church. The movie isn’t exactly a feel-good film, but it’s a heartrending little picture of a terrible, true event that one woman held on to for far too long. Shot partly in Ireland and partly in the D.C. area, the film lingers on the stunning Irish countryside as Martin and Philomena look for answers, contrasting the freedom of the open green fields with the gray, prison-like abbey. The script is tightly written and often very funny (Coogan is nothing if not clever), focusing mostly on character development and the chemistry between Martin and Philomena, while keeping the fairly complicated plot simple and straightforward. The script also serves as an entry in the ongoing debate between those who believe and those who don’t – Martin doesn’t believe in God, and while Philomena forgives the nuns who took her child away, Martin makes sure to tell them he never could. Dench, always reliably good, is heartbreaking here (even if her Irish accent never really came to light), as a woman who has kept things so pent up that she still keeps herself together in her most painful moments, and a woman who still remains positive, no matter what hurdles are thrown at her. For me, Coogan is the standout, in an unusually serious role for such a physical comedy icon. His Martin Sixsmith, having recently been let go as a government advisor, refuses to let this injustice stand, even though his own life experiences have left him jaded and depressed. In Philomena’s story, he not only finds an expose, but personal inspiration. By the grace of Harvey Weinstein, this little movie that could nudged its way into the Best Picture race, but it has little to no chance of taking home, really, any gold this Sunday night. Dench is up against some ridiculous heavyweights in her category, and as wonderful as she was in this movie, it may not have been her best turn. It’s a shame to see Coogan go without any recognition for his role, but like we’ve noted, it was a particularly crowded year. This movie is traditional Oscar bait, as usual – British, based on a true story, pulls at the heartstrings – but it will absolutely be overshadowed by the other nine nominees. That being said, this is an important story to tell, and this movie should be recognized for telling it in the first place. ← Oscar Predictions: Shorts Shorts Shorts!